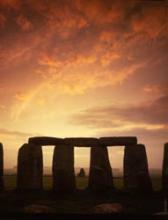 « Glastonbury Legends and Myths – The legend of Joseph of Arimathea at Glastonbury, Somerset. British Folklore – The Moonrakers, Wiltshire. Stories of yokels getting the better of townies pepper British folklore – perhaps the best known being one reading of the Nottinghamshire legend The Wise Men of Gotham . Rivalling that tale is the Wiltshire story of The Moonrakers, so dear to the heart of the county that to this day anyone born in Wiltshire is known as a Moonraker. The story goes that a couple of lads from a village near Devizes were involved in the spirits trade, and were not troubling the Excise with paperwork or duties. Depending on the source they were either distilling ‘brandy’ themselves, or obtaining it through illicit channels. These two entrepreneurs were warned of a raid by the Revenue, so for want of time and better cover they hid their contraband, including a couple of barrels of the good stuff, in a pond. When the customs officials arrived it was unfortunately a clear night, with a full moon and not a breath of wind to stir the water’s surface. The Wiltshire lads could see the barrels clearly, so they quickly came up with a ruse: grabbing rakes they waded into the pond and used the implements to disturb surface and silt, masking the tuns. 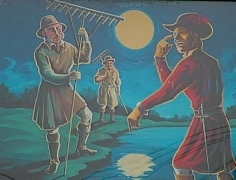 When the Revenue men spotted them and asked what they were doing, the yokels replied they were raking the moon in the pond in order to gather cheese from it. The clever Revenue men shook their heads at the peasants’ stupidity and searched the rest of the village, then finding nothing moved on.